The Grand Canyon is one of the most popular holiday destinations in the United States and probably the most popular in Arizona. Carved over time by the Colorado River, at 277 miles long, up to 18 miles wide and a maximum depth of 6,093 feet it is deserving of any and all accolades you may have heard. You have options of how you see the canyon and how you get there and in our case getting there really was half the fun. 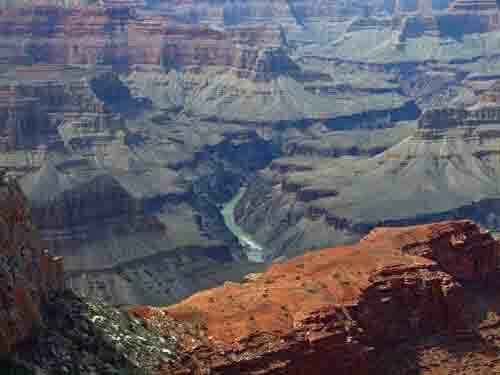 The canyon is one of Earth’s most powerful landscapes – something you have to see for yourself to believe. It tells a geological story that plays out over unimaginable time spans. Land masses colliding and drifting apart, mountains forming then eroding away, sea levels rising and falling and the relentless forces of moving water all cut the canyon into an elevated plateau. Founded in 1880 and located at an elevation of 6,770 feet, Williams is a town of approximately 3,000 residents. It maintains the charm of a late 19th century Western town. Originally a mountain town and logging centre, it was once home to gambling, opium dens and brothels. 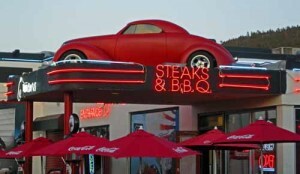 Today Williams sits at the gateway to the Grand Canyon on a very historic stretch of Arizona’s Route 66. It holds the distinction of being the last town to be bypassed by Interstate 40 on October 13, 1984 and has an abundance of soda fountains, restaurants, shops and motels from the glory days of America’s Main Street. 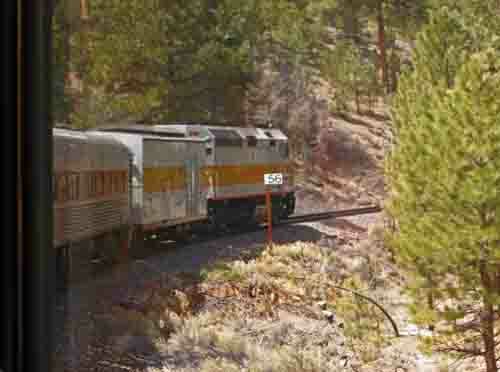 My wife Karen and I were travelling with our friends Murray and Karen and had chosen to take the train from Williams up to the canyon tomorrow morning. The train leaves at 9:35AM and it was so busy they added a second train. Apparently it is still spring break and has been for the last four weeks. There’s a Wild West Show at 9AM then the train ride to the canyon takes two hours and fifteen minutes. We will then be free to do as we please at the canyon and leave to return at 4PM. They make one stop on the return trip to pick up the train robbers. Excuse me, what was that again? That’s going to be interesting. Around 6:30AM a car alarm started blaring waking everyone in the motel. Karen thought it sounded a little close so she opened the door and sure enough it was our car. My “key” was on the TV stand on the other side of the room. I don’t know how or who activated it but I jumped up and silenced it right away. I heard the wind howling mercilessly and discovered it was indeed true. It was 52 degrees F and as we went to breakfast a young man came in and commented, “What’s going on? I drove 2000 miles for this crap? And who’s the moron who set off the car alarm earlier?” I looked at Murray’s wife Karen and just smiled – I thought I knew. The Grand Canyon Railway began in 1901 as a spur line of the Santa Fe Railway. The first steam-powered train chugged its way from Williams to the South Rim of the canyon. With the arrival of the train, this quiet area on the rim expanded into bustling Grand Canyon Village. The development of the village took place over the next three to four decades. The 1908 Williams Train Depot is listed in the National Register of Historic Places and is the oldest poured concrete structure in Arizona. The depot represents the glamorous days of rail travel when presidents, kings and movie stars awaited their departure on the same platform used by passengers today. Today we’ll take that crowd down a notch. Although Jessie played a mean banjo and sang some fun songs on the way up to the canyon our hostess seemed to be a brick short of a full load. Somehow, by comments made by Murray, she got the impression that Karen and I were Murray and his wife Karen’s kids! Now in what universe does that make even a little bit of sense?! I don’t know who should be offended more by that – Murray and Karen or Karen and me. The transportation system in the Grand Canyon is fabulous. You cannot drive your vehicle in about a 10 mile radius of Grand Canyon Village. The free shuttle service takes you to the places in the park you cannot drive. The three routes interconnect but do not overlap. You are free to get on and off at any stop. The Village Route is not a scenic route but provides excellent transportation within the village. It connects to the scenic Kaibab/Rim Route to Yaki Point to the east and the Hermit Road Scenic Route to Hermits Rest to the west. The buses run on clean, compressed natural gas thereby allowing you to reduce your carbon footprint on the park. It is an admirable green initiative. The Bright Angel Lodge was built in 1935 to provide moderately priced accommodations on the canyon rim. I think you can pretty much remove the word “moderately” from the equation today. We took our lunch and sat on their veranda to eat. This place holds some significance to Murray and me. After lunch I took a quick walk to the cabins on the canyon rim. I believe they are the same ones, refurbished of course, that Murray and I stayed in 41 years ago. I walked around in search of the cabin we stayed in. I have no recollection of anything nearby at the time; there were no parking lots, roads, shuttles and certainly no other hotels at the time but I’m reasonably sure I found it. I’m sure the cabins now come with a $200 per night bill, not the $12 we paid in 1971. Sure it’s right on the rim of the canyon but that big hole in the ground hasn’t changed. Mohave Point has a sweet view of the almost vertical, 3,000 foot high cliffs that encircle the abyss. Some of the canyon’s most magnificent spires and buttes can be viewed from there. It is impossible to comprehend that mere wind and water did all this. It is also impossible to comprehend that they allow you to walk out on rock ledges that have no barriers whatsoever and promise a drop of thousands of feet for any misstep. We wanted to get below the rim and this was the place to do it. Needless to say, the views were stunning so I was very annoyed to see a woman with her two young children walking along and talking on her cell phone. Give me a break! I have told you there are no barriers. What a reckless, brainless thing to do. We only had time to go about a kilometer down a very rough, rugged trail to a rock tunnel then turned around to head back up. Oh crap! That really is high! There were even signs that warned you were at 7,200 feet at the top, so take it easy. You were also cautioned that the trail was strenuous and would take at least twice as long to ascend as it did to descend so govern your time accordingly. Unfortunately we had to get back to the train. If you miss it you only need to remember two numbers – 65 and 144. It’s 65 miles back to Williams and it costs $144 to get there by cab. So we hopped the shuttle back to the Bright Angel Lodge. 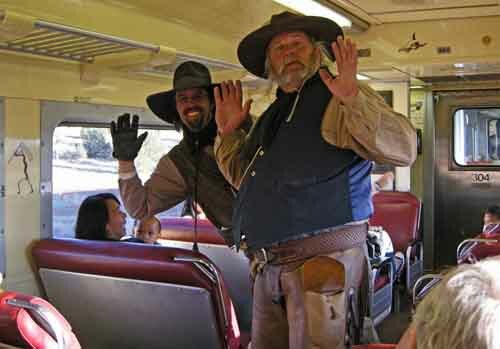 At about 5:30 the Cataract Creek Gang boarded the train. We saw them galloping alongside the train, guns drawn, bandanas pulled high up on their faces. They announced that they take money, jewelry and gold teeth. They were having fun with it but we escaped being hit even though we were prepared; I with money in my hat and Karen with it in her boot. They made their way past us and down the aisle onto the next car. In moments the sheriff was at the front of our car asking which way they went. Everyone pointed and in perfect unison shouted, “They went thataway!” I was very impressed with the way this was playing out. I likened it to performing a play on ten different stages one after the other. These guys are good. Much more travel writing by this author in his book, That Road Trip Book.